Brooklyn pain management clinic are internationally recognized as one of the best back pain management specialists and doctors in Brooklyn, NYC. We were selected to be a part of international medical team for Rio Olympic Games. We offer a full range of advanced rehabilitation and pain management services including electrical nerve stimulation among latest cutting edge procedures: Body Composition Analysis, High Tech Shockwave Therapy, groundbreaking Interstitial Laser Therapy. Your spine is very flexible, which is why it allows you to bend, sit, twist and subsequently walk and run. This is because it is not a solid block of bones, but is instead a series of smaller bones (vertebra) called facet joints. These joints’ surfaces are lined with cartilage and lubricated with synovial fluid to allow them to slide over each other, providing motion in any direction. That, however, is a healthy spine. With age, the lubricating cartilage wears off and sometimes even growths called bone spurs can develop, leading to friction between the facet joints. When this friction then leads to swelling, tenderness, stiffness and later on, pain with every movement, the resulting condition is referred to as facet joint syndrome or osteoarthritis. Overuse: because of carrying excessive weight or as a result of sports, the facet joints may be overused and damaged well before their time. By overloading your spine, the cartilage quickly wears off and bones begin rubbing on other bones. As the individual vertebra discs rub off on one another and begin to degenerate, the joints become maligned and bone spurs begin to form. These bone spurs will eventually grow and extend into the spinal cavity, pressing into the nerve roots and eventually the spinal canal itself. Presence of other diseases such as gout, arthritis or infection: if there had been another disease already affecting the spine, the facet joints would already be damaged and eventually break down completely. Damage from injuries, whiplash or incorrect sleeping posture: while the facet joints may be flexible, they do have their limits. Injuries to the spine directly damage or fracture the individual vertebra, causing them to malign. Whiplash and sleeping posture, on the other hand, exert immense pressure on the joints, and when repeated may cause them to disintegrate. Family history of the condition: studies have shown that children may inherit maligned spinal vertebra from their parents, eventually contracting the same condition. The diagnosis starts with a physical examination to determine the affected area, than the doctor may order X-rays of your back. In the case of any abnormalities, a CT scan will be requested to get a better look at your facet joint surfaces. These will inform the doctor about the problem areas and the extent of the damage. This involves an injection directly onto your facet joint with a local anaesthetic and cortisone which is an anti-inflammatory medication. The procedure is done with the help of a fluoroscope which uses X-rays to guide the doctor in the position of your facet joints. Once carried out, the medication may last anywhere from a few days to months. For a more conservative and unobtrusive procedure, physical therapy may be suggested to help ease the symptoms. This has been proven to work and usually reduces inflammation to the affected area, thereby improving mobility. When all other options fail, surgical treatment is always an option. It involves joining of the two vertebrae together with metal screws and bone graft removed from your pelvic joint. 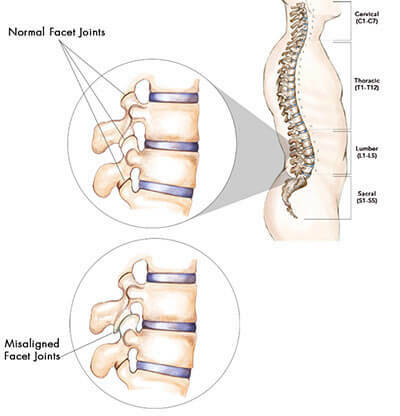 Facet Joint Syndrome pain management doctors and specialists at Pain Physicians NY (Brooklyn & NYC) offer individualized approach, the most effective Facet Joint Syndrome treatment options utilizing the latest technologies available in USA. The pace at which technology is growing can make last year’s methods obsolete. Our team is always at the top of their game and at the head of the pack.